NASCAR Race Mom: Get The Name of Your Choice On A #NASCAR! When you are watching a NASCAR race, you’ll notice that the cars are full of different logos and decals for companies and organizations that sponsor the driver. 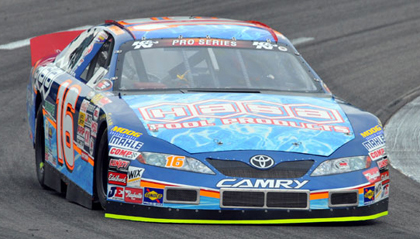 Moses Smith (my son) proudly displayed his sponsor's logo on his hood. Have you ever wondered how much the privilege of that advertising cost? According to Adweek, a primary sponsorship in 2013 cost anywhere from $5 million to $35 million. An associate sponsorship cost anywhere from $250,000 to $2 million! Now you do not have to be a multimillion dollar business like the Duck Commander and the Robertson family (Franchise of TV's "Duck Dynasty" signed on in 2014 to lend namesake to a Texas Cup race) to see your name or special message in a NASCAR race on a participating race car. 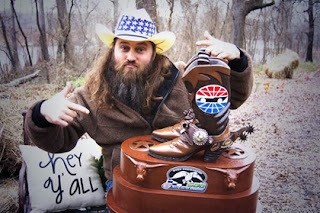 Willie Robertson and Family sponsor a race! "We're excited about the partnership for the Duck Commander 500, being aligned with NASCAR, and to have our brand associated with an event of this magnitude," shared Duck Commander CEO Willie Robertson in February of 2014. "We are all big fans of NASCAR and have been all our lives. It's especially exciting to see our brand join to make it an awesome experience for the fan base and we can't think of a better place than our neighbor at the Texas Motor Speedway." Fortunately, you do not have to have Millions - Thanks to Mary Dixon from MDRmotorsports.org (Making Dreams Reality Through Motorsports), you can now place your name, business logo, or name of a loved one on Joey Gase’s #52 NASCAR Xfinity Series car. "It was the dream of two of our group members to promote cancer prevention and awareness through motorsports. We are so excited to help their dream come true, contribute to these terrific charities, and have FUN with all of our names on Joey Gase's car hood!" For a minimum $25 donation, your name or logo will appear on Joey's car hood for the Xfinity race at Charlotte Motor Speedway this October. If you want the name listed even LARGER on the car hood, the $50 donation is the reasonable cost. Lastly you could do as NASCAR Race Mom did and donate $100 for placement of a picture of my logo! Now I cannot wait for the “The Drive for the Cure 300 presented by Blue Cross Blue Shield of North Carolina.” This race features the NASCAR XFINITY Series regulars beating and banging in a Friday night slugfest under the lights at Charlotte Motor Speedway. Then I will be able to cross off “be a NASCAR Sponsor” from my bucket list. Even More Importantly - Proceeds from this project will be divided equally between The American Cancer Society and St Jude’s Children’s Hospital! How exciting to be able to get our company logo on Joey's car. And be able to donate to two outstanding organizations makes this a win win opportunity for me to take advantage of. I fortunately had the chance to meet Joey Gase up close and personal. What a kind hearted young man. He showed us his hauler, answered and explained any questions we had. I will be taking advantage of this chance to have the name of a couple of loved ones on the car. This may be the only chance I get to be a SPONSOR OF A NASCAR entry. Thanks MDRMotorsports! Thanks so much for your support MrsE88!